Weighs the laundry and recommends the ideal amount of detergent. Recognises the type of laundry by establishing textiles’ water absorption characteristics. Determines how soiled your clothes are. Reduces wrinkling and removes undesirable odours from fabrics. Determines how much water will be needed for the wash cycle. Measures water purity to ensure that no detergent residue remains in the laundry. Has a distinct fashion sense. 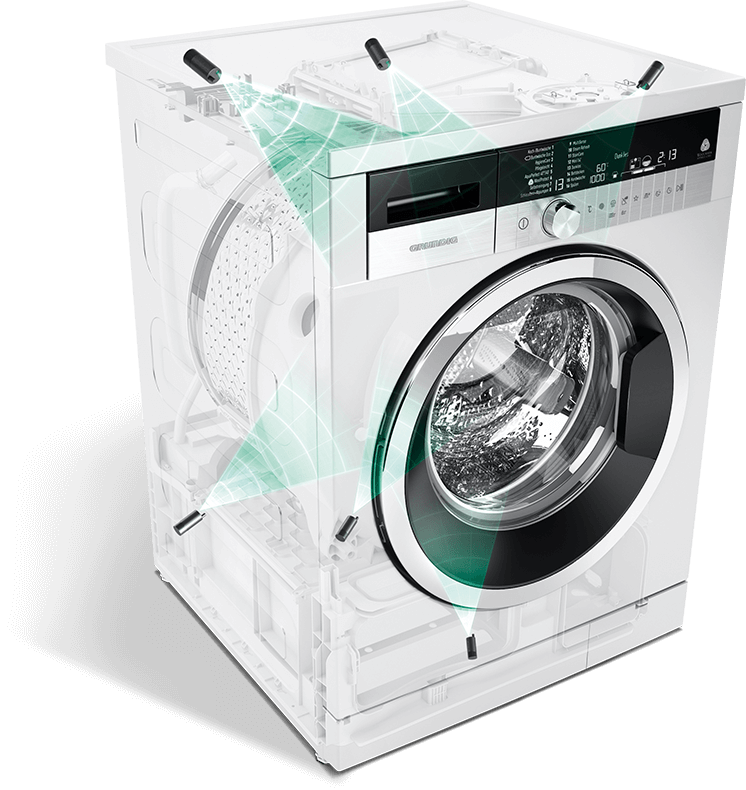 With its flair for fabric and machine care, the Grundig MultiSense Technology provides perfect control of washing parameters with smart sensors. These leads to satisfying cleaning results with optimum use of water, energy consuption and safety for your machine. Special sensors recognise types of textiles, load amount, soil level, and control required temperature, amount of water and spin speed . All of which is good for your clothes, machine and your peace of mind. That leaves only one thing for you to worry about-what you are going to wear. Thanks to MultiSense Technology’s special sensors, ProDose Technology automatically determines the amount of laundry, the type of fabrics and the degree of soiling. Based on this information, the automatic dosing system precisely calculates the exact amount of liquid detergent and fabric softener needed for each cycle. All you have to do is fill up the detergent once and perfect washing results for the next 20 washing cycles are guaranteed. 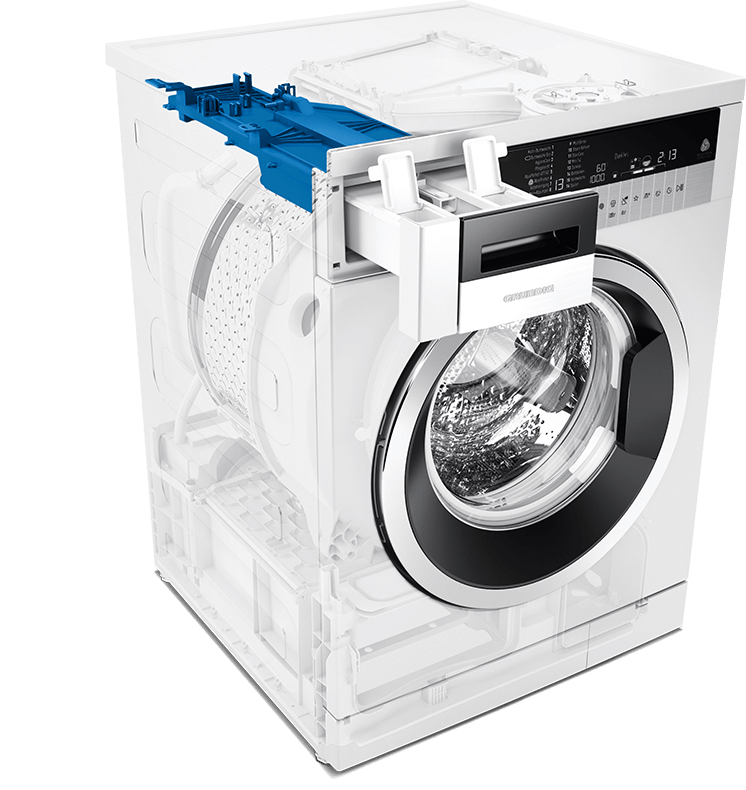 In short, the GWN 59464 C is economical not only with detergent and water, but also with your time. Energy consumption so low, it needs a new energy efficiency rating. The Inverter EcoMotor reduces power consumption to an absolute minimum – beating the best energy efficiency rating of A+++ by as much as a further 70%. This achievement is the result of a brushless design and variable-speed technology that works without friction. Not only does this innovative motor save energy, it also reduces noise levels to 45 dB for the main wash cycle. So it comes as no surprise that it’s our engineers’ pride and joy. Not only efficient, but silent. This ultra gentle wash programme and spin algorithm prolong the life of your most valuable and delicate clothes, preventing discolouration and fabric damage. Washing performance is increased while water consumption is decreased. A spray pump system that forces a detergent solution through dual nozzles onto the clothes effectively saves water. This sustainable technology ensures deep penetration of stains. A double-walled hose protects your home from damage. Water-absorbing material between the inner and outer hose instantly detects if the inner hose is broken and cuts off the water intake from the tap. A sleek glass design improves your washing per- formance by enhancing interaction between laundry and drum. Omits spin cycles and cancels the main programme’s final spin – which can be set manually the next morning. The result is a silent, sleep-friendly environment after bedtime. Removes undesired odours with steam. The steam also reduces wrinkles, making ironing easier. With ist soundproofed S-shaped side walls, cabinet insulation, brushless motor technology, electronic unbalanced load control algorithm and new-generation shock absorbers, this machine reduces vibration and noise throughout the spin cycle. The electronic Text LC Display with Touch Control Buttons brings ergonomic benefits and ease of use to your home. It automatically recommends settings that ensure maximum water and energy efficiency, displays the temperature, soil level and load size.